Whether you are deep in the waters of the Pacific Ocean taking a snorkel tour to Molokini or high above on one of the world's largest dormant volcanoes, Maui is a paradise for everyone. Maui's magical Isles are full of Hawaiian culture, beauty, fun and excitement and whatever your preference may be, the award winning Wailea Golf Club, which is nestled along the spectacular southern coastline, is one of the world's leading luxury destinations. 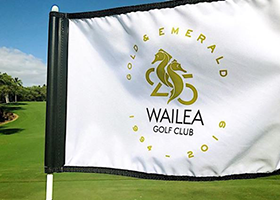 Wailea's award-winning golf courses, Wailea Gold , Wailea Emerald and Wailea Blue , are set in the heart of Wailea Resort, one of the world's premiere golf destinations. Rated one of the best golf resorts in America by Golf Digest and Golf Magazine, Wailea is renowned for its scenic splendour, eternal summer-like days and legendary spirit of aloha! Gary Player once said of Wailea: "I don't know what the most beautiful coastline is, but this certainly compares to any place in the world".